Parents! Are your kids sick of Pokemon? Are their fat little fingers too pudgy to properly control a Playstation? Do they crave battling mammals?!? Don't fret, the answer to your prayers is here! It's cute, it's oily, it couldn't get any hotter.. .it's an otter! 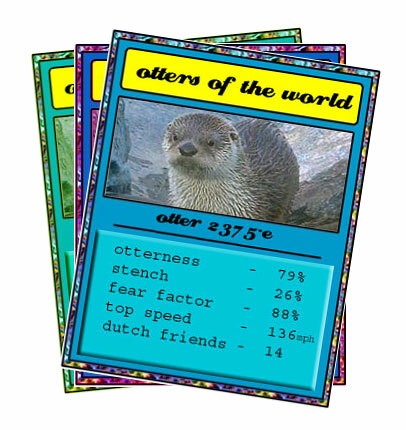 Let otter battle otter with these fantastic new trading cards! Each otter is ranked for otterness, stench, fear factor, top speed and number of Dutch friends. It literally could not be simpler!